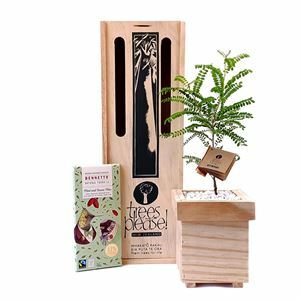 They'll love this thoughtful living tree gift, given with love and presented with Organic Chocolate made in Switzerland by Bennetto. The tree will give pleasure for years to come but the delicious chocolate will be enjoyed all too soon! Baby living tree of your choice (36-43cm) presented in a custom-designed sustainable pine wooden planter box containing high quality potting mixture, finished with white river stones. Please select tree type from drop-down menu. special sustainable pine untreated pine wooden carry box.